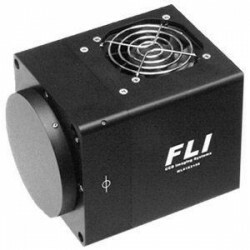 Now, let's talk about FLI MicroLine CCD Camera Cooling... The FLI MicroLine's robust cooling design achieves a sustainable cooling performance of 50-55 deg C below ambient. The camera's CCD can be operated at -30 deg C with typical room temperatures and without the need for water cooling or special cooling sequences. Simply set the MicroLine cooling where you want it and the camera will do the rest - quickly and worry-free.